ULSTEIN BRIDGE VISION™, the results of the research project Ulstein Bridge Concept (UBC), was presented today at ONS 2012 in Stavanger by the Minister of Trade and Industry, Trond Giske and head of marketing and innovation in ULSTEIN, Tore Ulstein. The bridge concept was developed in the maritime design laboratory at the Oslo School of Architecture and Design (AHO). The front bridge of the ULSTEIN BRIDGE VISION™. The aft bridge of the ULSTEIN BRIDGE VISION™. Video from the press conference where ULSTEIN BRIDGE VISION™ was presented will be published at www.ulstein.com. For almost 40 years ONS has been a broad-based international energy event, and a meeting place for everyone involved in the entire energy sector. The biennial event has been staged in Stavanger, Norway. The very first ONS exhibition in 1974 welcomed just 7 000 visitors. In 2012 more than 50 000 guests are expected. Ulstein Bridge Concept is a collaborative project funded by the Norwegian Research Council’s MAROFF programme and the Ulstein Group. It consist of participants from the Oslo School of Architecture and Design (AHO), Ulstein Group, Kwant Controls and Aalesund University College (HiALS).The multidisciplinary team collaborates in making bridge concepts for advanced offshore ships of the future. 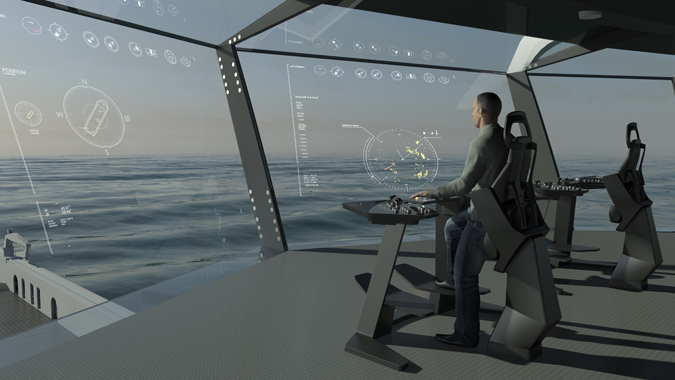 ULSTEIN BRIDGE VISION™ is a result of the UBC-project. In addition to developing groundbreaking design, UBC is pushing design as a discipline forward through research. The project began in April 2011 and will run over three years. Two PhDs are made as a part of UBC. After one year of research, UBC have published two patents, four conference papers and one design protection. The Oslo School of Architecture and Design (AHO) is a specialized university and a leading international architecture and design school that provides edu¬cation within architecture, landscape architecture, urbanism and design. AHOs fields of knowledge focus on design in all scales, objects, buildings, urban areas and landscaping. AHO is organized into four institutes, and has approx. 600 students and 120 employees. The Institute of Design is responsible for educational and research activities within industrial design and interaction design. The institute educates designers who shape and develop products, services and interactive experiences. Ulstein Bridge Concept is one of the research projects carried out at the Institute. Ulstein Group has around 800 employees in eight countries and is headquartered in Ulsteinvik, Norway. Ulstein delivers products and services within in the areas of ship design, shipbuilding and power and control systems to the international marked of offshore ships. ULSTEIN has activity within four areas: Design & Solutions, Shipbuilding, Power & Control og Shipping. In 2006 Ulstein delivered the first ship with the groundbreaking and environmentally friendly X-BOW® hull line design, Bourbon Orca. After the first flag ship was delivered, they have sold a total of 45 designs with X-BOW. The design is sold to 12 different ship owners to be built in ship yards in China, Dubai, Brazil and Spain, in addition to the building at their own ship yard in Norway. Kwant Controls has been one of the world’s leading manufacturers of nautical controls and systems for ships for more than 70 years. The products delivered by Kwant Controls include their remote control system and indicators for all existing propulsion systems. Aalesund University College has about 2000 students and 200 staff. The University College offers a wide range of study programs in business management, engineering, health care, fisheries and maritime trade.